Public Release!! 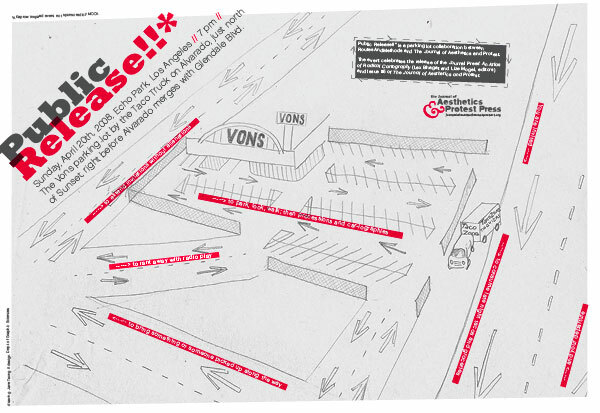 * is a parking lot collaboration between RoutesAndMethods and the Journal of Aesthetics and Protest in celebration of An Atlas of Radical Cartography and Issue #5. The Vons parking lot by the Taco Truck on Alvarado, just north of Sunset, right before Alvarado merges with Glendale Blvd. An Atlas of Radical Cartography (edited by Lex Bhagat and Lize Mogel) pairs artists, architects, designers, and collectives with writers to explore the map’s role as political agent. These (10) ten mapping projects and critical essays take on social and political issues from globalization to garbage. - An Architektur / Sebastian Cobarrubias, Maribel Casas-Cortes on migration in Europe. -Center for Urban Pedagogy / Heather Rogers on garbage flows in New York City. -Institute for Applied Autonomy / Tad Hirsch on surveillance and “tactical cartography”. -Pedro Lasch / Alejandro DaCosta on migration in the Americas. -Lize Mogel / Sarah Lewison on geography, gentrification, and globalization. -Trevor Paglen & John Emerson / Naeem Mohaiemen on extraordinary rendition. -Brooke Singer / Kolya Abramsky on the contradictions of cheap energy in the US. -Jane Tsong / Jenny Price, D.J. Waldie, et al, on human impacts on LA’s water ecology. -Unayyan / Jai Sen on mapping the unintended city in 1980s Calcutta. Public Release!! * took place on April 20, 2008 from 7-10pm in the Vons parking lot where Echo Park's favorite taco stand, Taco Zone, sets up shop every night on the curb just outside of the fence. We decided to create a thorough map of what happened, what led up to the event and to put forth some rumination about the future. One of our main thesis is that through creating self-defined maps, a greater clarity of ones actual, percieved, and potential world occurs. The left side of the screen has the content and this side has the navigation.